This blended lot comes from three classic single-vineyard sites in three separate appellations: Andy Beckstoffer’s To Kalon Vineyard in Oakville, our estate Hewitt Vineyard in Rutherford and Three Palms Vineyard in Calistoga—Triple Appellation, Triple Single Vineyard, Triple Good. Each appellation offers three distinct climates (warm, warmer, warmest) and three different styles to the blend: Oakville gives berry fruit and sweet tannins, Rutherford offers up the classic “Rutherford Dust” and gives structure with balanced acid and tannins, while Calistoga lends black fruit flavors and velvety texture to the wine. This never-before blended lot shows the unique personality from each site. The challenge to our winemaking team is to create a sumptuous wine while showcasing all the individual pieces that comprise the blend. Tom has made wine at some of the valley's most important wineries, apprenticing at Freemark Abby, Rutherford Hill and Round Hill before joining Dan and Margaret Duckhorn to help found Duckhorn Vineyards in 1978. 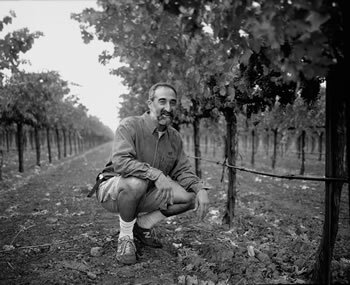 There, for two dcades, he established himself as one of the Napa Valley's premier fashioners of elegantly classic Cabernet Sauvignons and Merlots. It's a privilege to work with the exceptional fruit from the Rutherford, Oakville and Carneros district to craft the wines. I love everything from anticipating the vineyards' seasons to experimenting with new technologies. I love the way we use innovative practices right alongside traditional methods. Q: Fill in the blanks: I chose to make this wine from this particular ______________ because ______________. A: I chose to make this wine from this particular blend because It provides a chance to blend two Titans.